Three men have already been convicted of their role in the death, after the taxi the Dewanis were travelling in was hijacked as they passed through a township late at night. 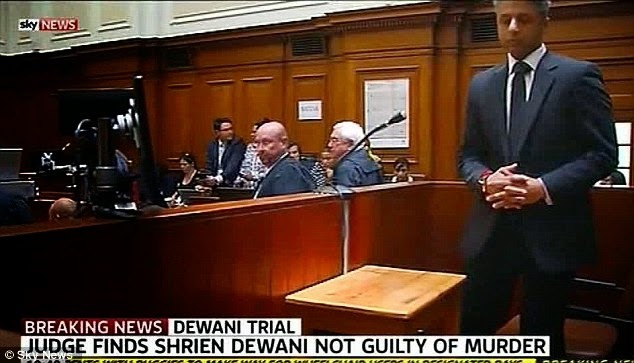 Dewani has always denied any involvement in the plot. But prosecutors say bisexual Dewani wanted out of the relationship and plotted for his engineer wife, 28, to be killed in an apparent botched hijacking.He was accused of recruiting a taxi driver, Zola Tongo to stage a fake carjacking as a cover for her murder, with the help of two assassins. South African Judge Traverso tore into the testimony from the state's key witness, Dewani's taxi driver Zola Tongo, saying it was 'riddled with contradictions'.Tongo, who was previously convicted of his part in the killing, entered a plea bargain with the State to testify against Dewani. The judge also highlighted that two hitmen also convicted of the murder 'contradict Mr Tongo on just about every aspect of their interaction'. Judge Jeanette Traverso said the prosecution had 'fallen far below' the level needed to secure a conviction and attacked the state's chief witness for giving testimony of such 'poor quality' she did not know where the 'lies end and truth begins'. Dewani showed little reaction in the dock as the verdict was delivered, bringing to an end his four-year ordeal in which he was accused of orchestrating a plot to murder his wife on their honeymoon in Cape Town. Lawyers say he could now sue the South African authorities for attempting to use his sexuality as a 'motive' for wanting his wife killed as a 'way out' of the marriage.